It can be fun. Seriously. Most days, I think I’m a born networker. But admittedly there are times I find it difficult to walk up to someone new and introduce myself. 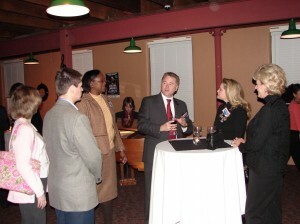 When that happens, I review the tips I use at networking events such as a Chamber of Commerce After Five event. DO attend the networking event with goals in mind. I develop my goals based on the answers to these questions: Do I want to meet a specific individual? Management of a certain company? Someone from a targeted industry such as a realtor or an accountant? Or is my goal to reconnect with someone I haven’t seen recently? On an evening when I’m off my game, I might ask a mutual connection to make introductions and get the conversation started. DO bring business cards and exchange them as connections are made. Not only will this make it easier to connect in the future, it helps the brain anchor information. I have a hard time remembering the names of people I just met. So while conversing with a new contact, I periodically glance at the business card to etch the person’s name, title and company in my head. DO engage. Ask questions and listen. My go-to conversation starters are: Tell me about your company, and, tell me about your role with the company. I ask follow-up questions based on the answers. DO enter new contacts into Outlook or your business phone’s directory after the event. I add notes indicating when and where I met new connections. This helps me locate the person in my contact list when I can’t remember a name but I remember where or when we met. The event information I documented can be used to find the elusive contact. DON’T sell. My home phone number is on the do-not-call list for a reason – I prefer to do business with people and companies I know and trust. That philosophy carries over into my professional life. Your best strategy to sell me in the future is to use our initial meeting to lay the foundation for a working relationship. DON’T monopolize the conversation. Remember, the goal is to build a relationship and that takes two people. DON’T scan the room searching for your targeted contacts while talking to someone else. Save the room scans for the time between conversations. You may be pleasantly surprised to find the person you are talking to is the best connection of the night. So the next time you attend a networking event, try these suggestions. Then let me know how they worked for you. Send a tweet to @Delora4Biz or post your comments below. I look forward to learning from you.